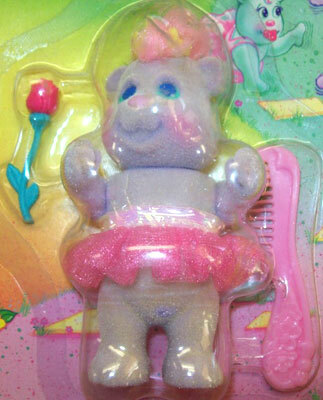 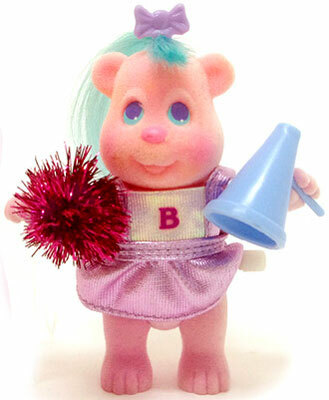 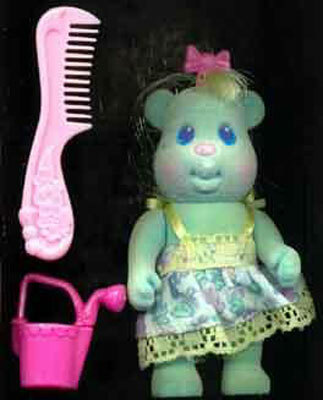 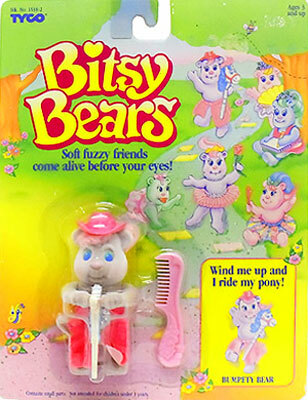 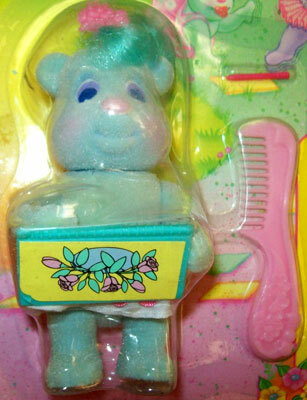 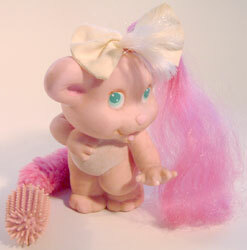 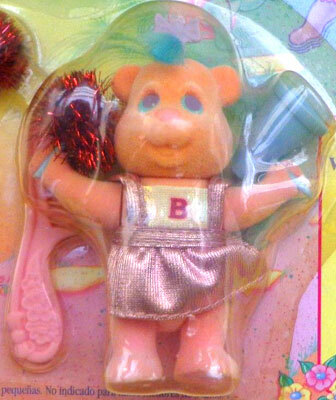 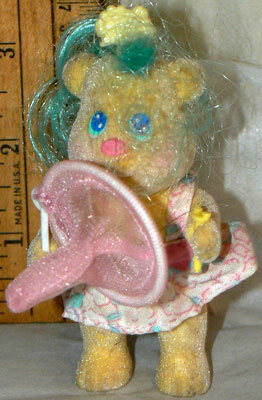 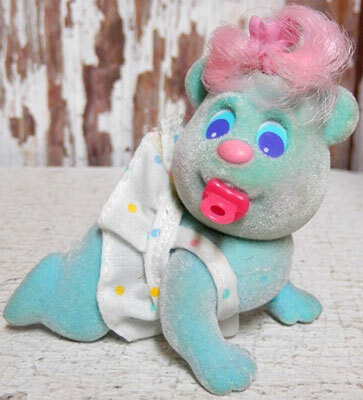 Bitsy Bears were produced by Tyco in 1991-92. 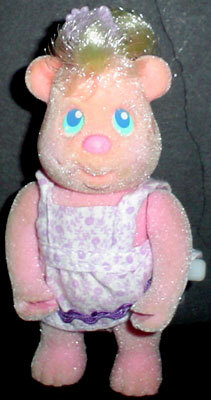 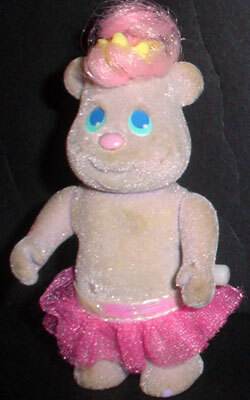 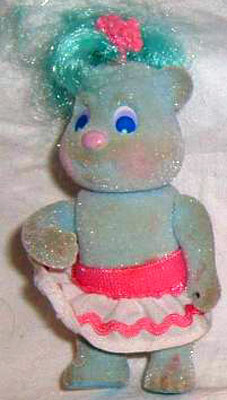 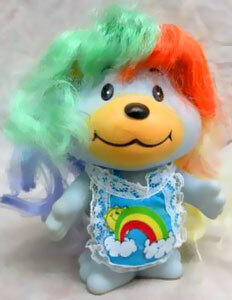 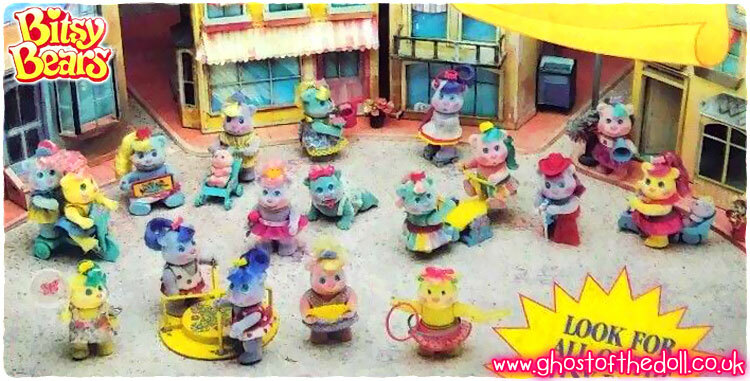 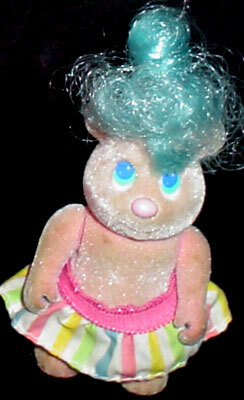 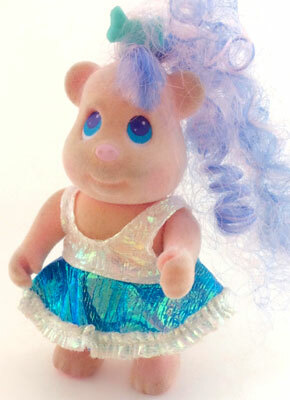 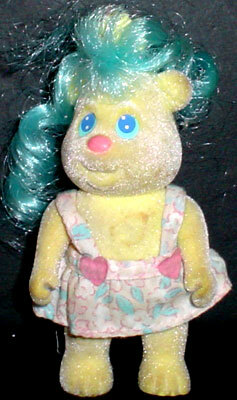 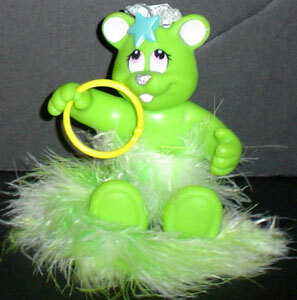 They were a series of 4" flocked poseable bears and each one had its own wind-up action. 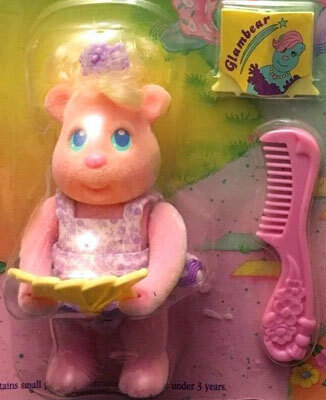 There was also an animated video. 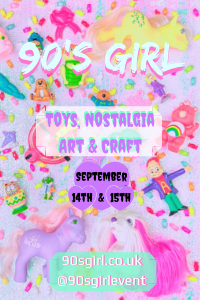 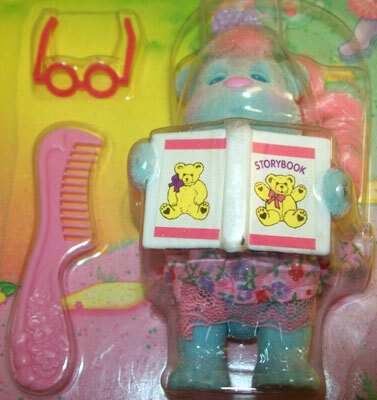 Images on this page thanks to Jana, Miss Leonie, Pamallah1 and eBay seller Balelo ! 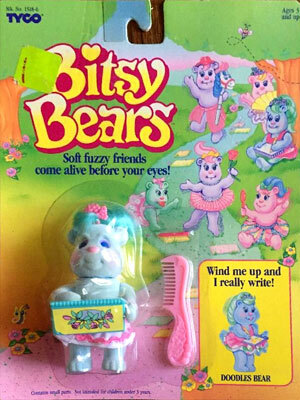 View all Bitsy Bears on eBay.com or eBay.co.uk ! 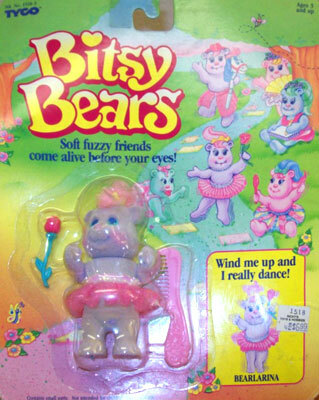 "Welcome to the land of the Bitsy Bears! 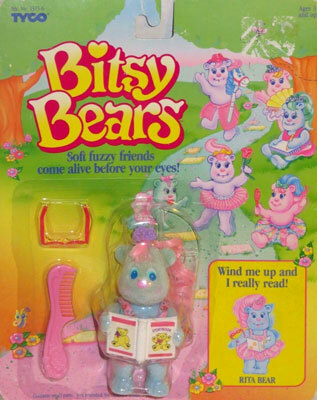 In the tiny land where the Bitsy Bears play, there's magic happening every day! 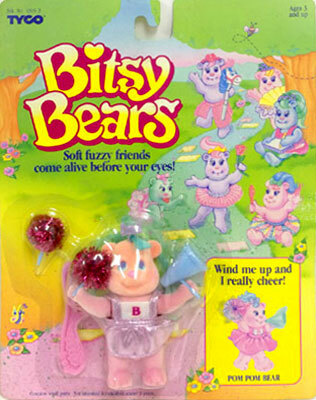 It's an enchanted place whose very air sparkles with energy of the Bitsy Bears' good will and kindness!" 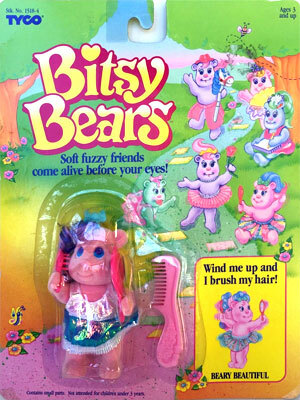 There were twelve original Bitsy Bears produced, and each one came with a comb and small accessory. 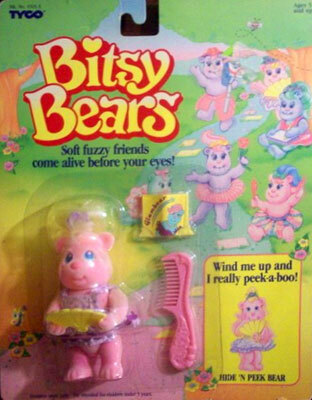 Back packaging had a story for each bear. 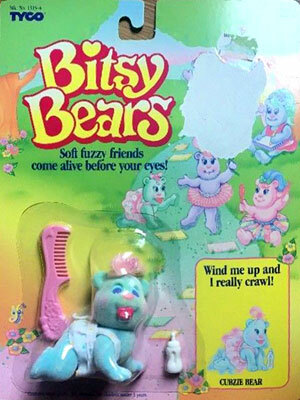 "Wind me up and I really try to catch butterflies!" 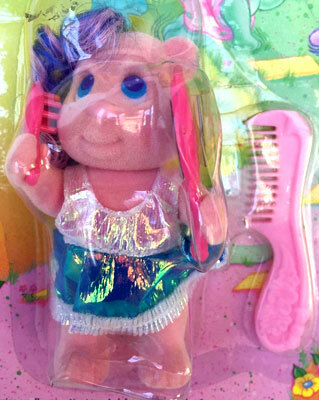 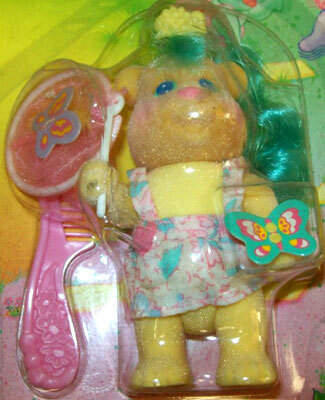 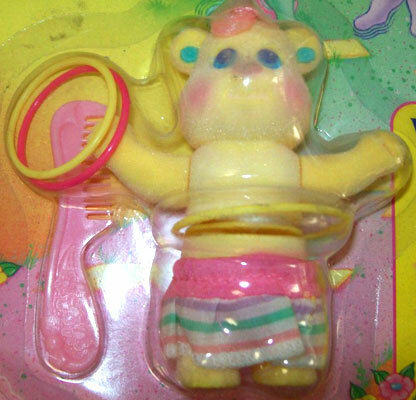 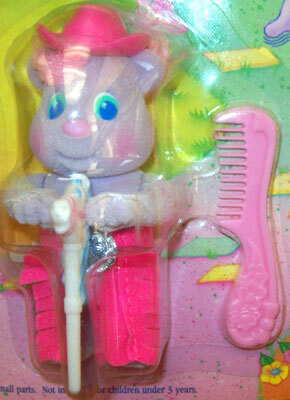 Flutterbye Bear came with a butterfly net, butterfly and a pink comb. 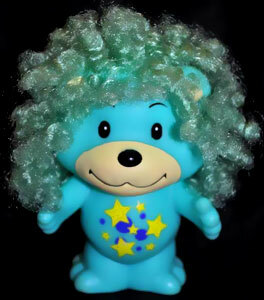 Flutterbye Bear is a day dreamer who spends sunny afternoons frolicking in a sweet bed of clover chasing butterflies and rainbows. 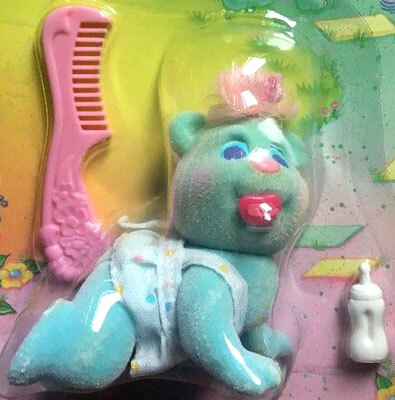 If she could only reach that high! 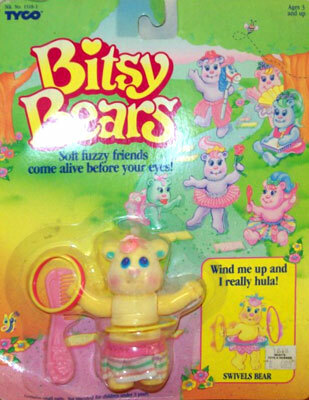 She is forever asking her best friend Bumperty Bear, "Did you see a butterfly flutter by?" 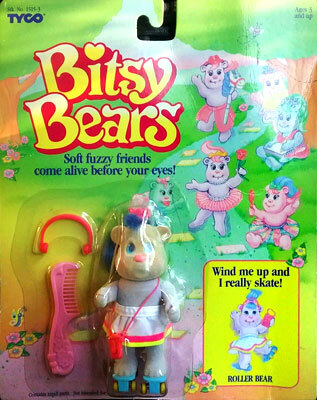 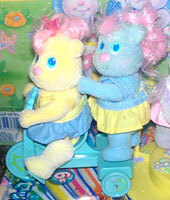 "Beary Happy Bear loves to have fun, so she's in charge of making sure that the Bitsy Bears are having a great time. 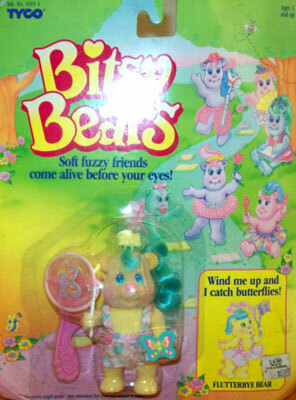 When any bear is sad she brings them to the Musical Fair where they buy colourful balloons and eat ice cream all day! 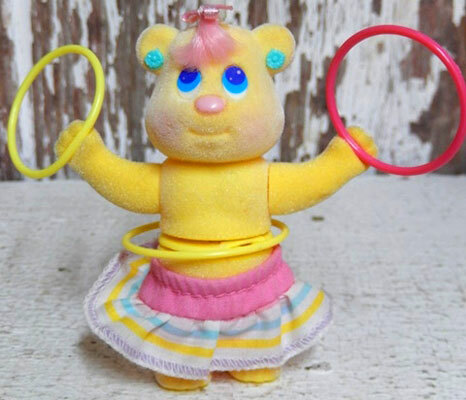 This, she says, is the most fun of all. 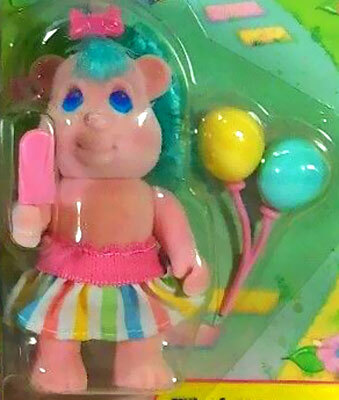 Wind her up and she will eat her ice cream." 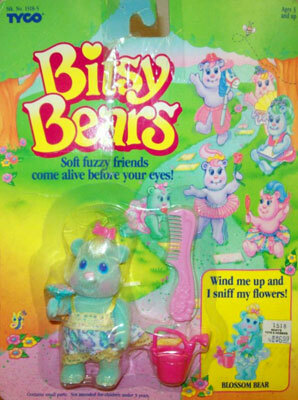 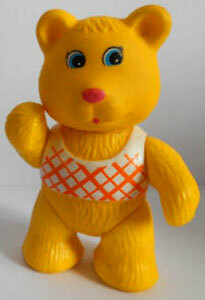 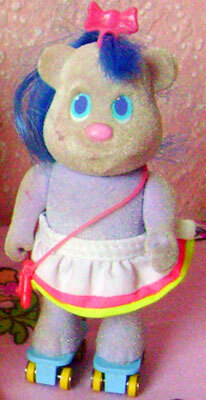 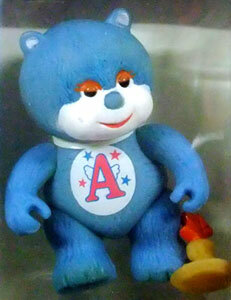 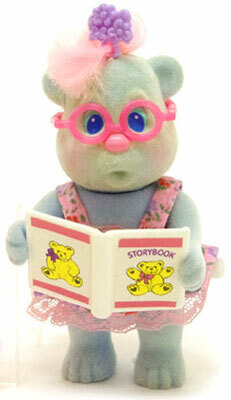 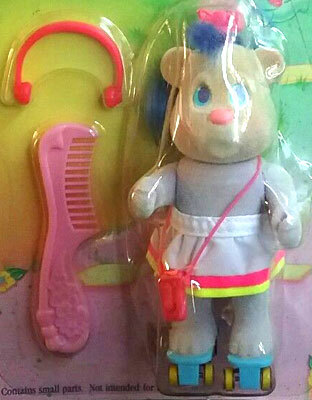 There was also one bear who came with a 25 minute animated video called The Adventures of the Bitsy Bears. 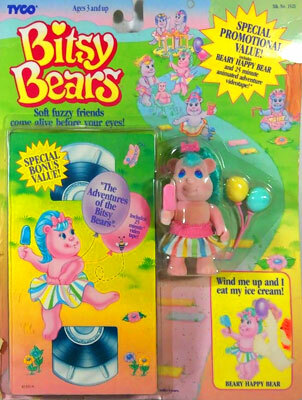 She came with a pink ice cream and a pair of balloons. 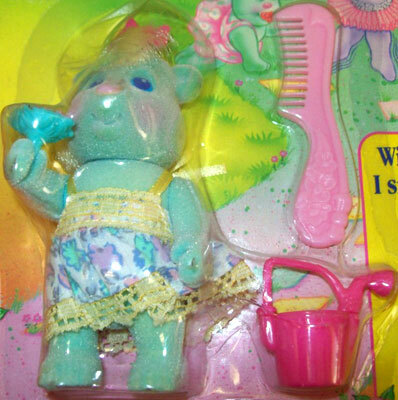 "Wind me up and I really eat my ice cream!" 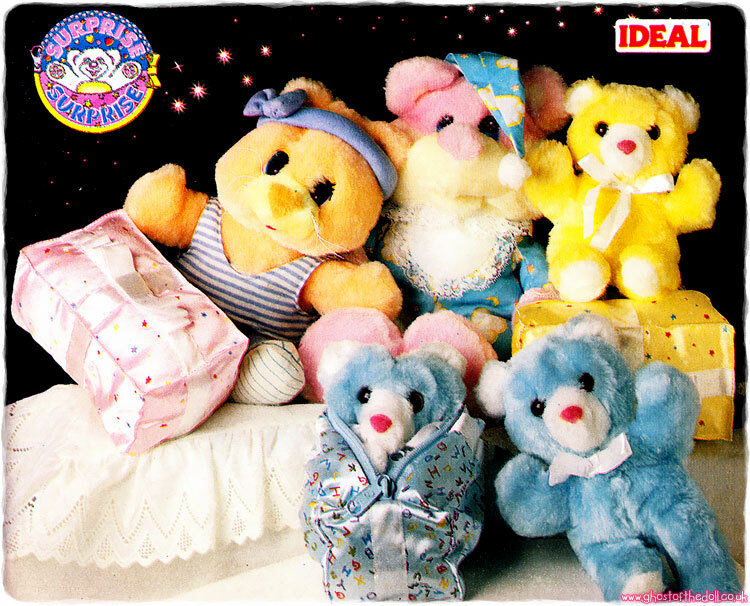 Back packaging had a photograph of ten of the original bears, all three pair sets and two of the baby sets. 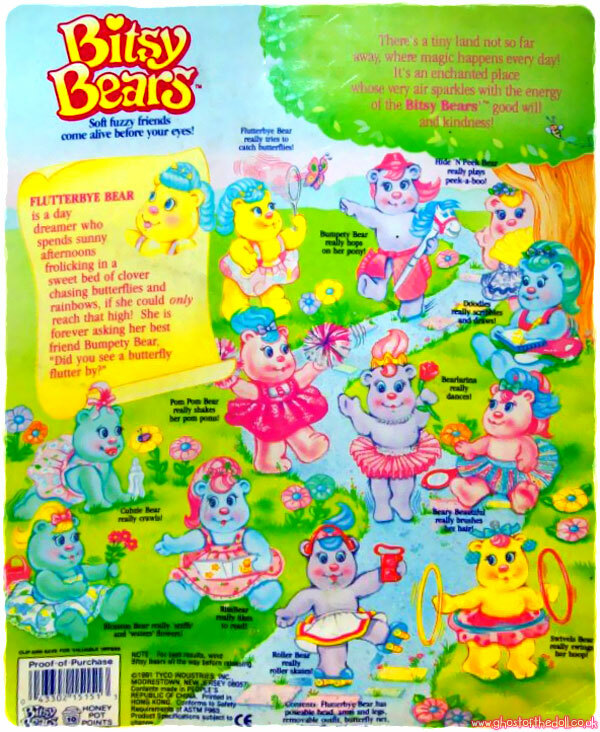 Beary Happy Bear herself was not featured.